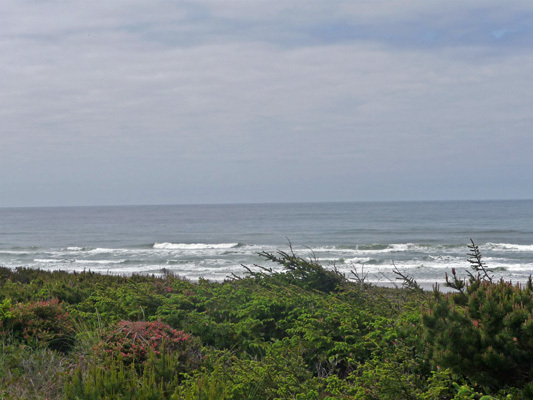 On Thursday April 30th, we left Champoeg State Park south of Portland and drove north a short ways and then west on Highway 18 to the Oregon Coast. 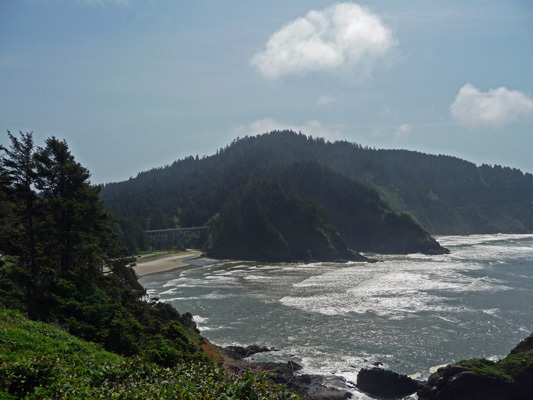 Then we headed south on Highway 101 down the coast to Carl G Washburn State Park. We pulled into the campground and checked in with the Camp Host as we’d been instructed and he knew absolutely nothing about us coming. But he did mention that there we hosts who had arrived the day before and their spots had reserved signs on them. So we drove on through the campground looking at the available spots and sure enough there were “Reserved for Camp Host” signs on several spots. But they all had other folks names on them. Just when we were getting ready to give up and drive the loop again looking for a spot, we came to the last 2 spots and they both had reserved signs on them. Walter hopped out and sure enough our names were on spot 57, the last spot in the park! It turned out to be a real challenge to get into spot 57, because there was a curb directly opposite from it that the passenger side front truck tire kept hanging up on as Walter tried to back in. But with a bit of trial and error and observation we jockeyed our way in. As we were setting up, Deb, the Lighthouse Ranger, drove up and greeted us. She gave us a very thick notebook and told us to fill out the forms in it and read the notebook that night as we had a training session at 9 am the next morning. We were both tired from the drive (and in need of lunch) and the idea of slogging our way through a bunch of forms and lots of info on the lighthouse and procedures wasn’t greeted with great joy. We spent the rest of the afternoon and evening filling out forms with one of us reading our notebook (and the other reading that of the folks across the way since Deb had given us theirs to deliver to them when they arrived at about 6:30 pm—they weren’t thrilled with the assignment). The notebook is truly wonderful, filled with tons of information on the lighthouse. And it comes in handy day after day when you need information to answer everyone’s questions but it was very over-whelming the first night. 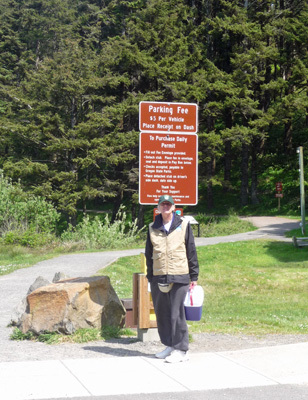 On Friday May 1st, we reported for training at 9 am at the shop area just north of the campground. There were 2 other couples who were also new hosts (there’s a 3rd new couple but they didn’t arrive until later that day). We got 2 hours of training and then at 11 am Walter and I grabbed our lunch and drove down to the lighthouse. We took a couple of minutes to eat part of our lunch, sitting in the lighthouse parking lot. Here’s the view that first gorgeous day. The house up on the hill is the Assistant Keepers’ House. It was a duplex in which the 2 assistant keepers and their families lived. It’s now a bed and breakfast (a Forest Service concession on 20 acres of federal land in the middle of the state park). Then we put on our new official Oregon State Parks Volunteer vests and hats and started the 3/8 mile hike up to the lighthouse for our first 4 hour shift as lighthouse volunteers. The trail winds up the hill through the woods. 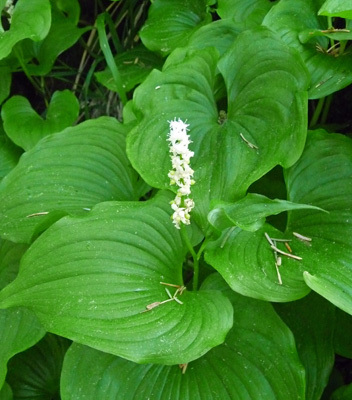 There were tons of False Lily of the Valley (Maianthemm dilatatum) along the way. 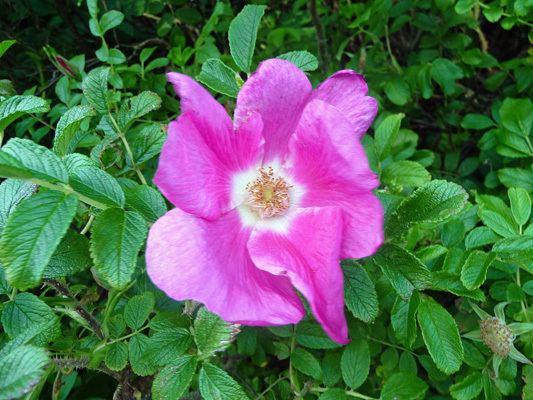 And there was one bramble of huge fragrant rugosa-type roses. I don’t know if they’re natives or simply escaped rugosas or something someone planted. It’s a pretty steady upward climb and so it gets you nice and warm by the time you arrive up at the lighthouse. Thank goodness, there were two experienced hosts up at the lighthouse when we got there. They showed us the ropes, allowed us to take a couple of tours with them and then, in my usual reticent style, I jumped right on in and gave my first tour. It went well and I was on my way. The tours can take anywhere from 10 to 20 minutes depending on whether there are people already on tours in front of you and/or folks waiting for tours behind you. 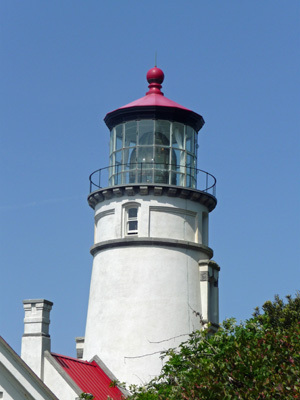 The lighthouse is 120 years old and recently renovated (only reopened in June 2013 after 2 years of work). Because of the age of the tower and the nature of the design (I promise to take you on a tour in my next email) tours usually only have 4 people in them and a maximum of 6 (plus the tour guide) since they don’t want to have more than 1000 extra pounds (1500 at an absolute max) up in the tower at any given time. It’s a lovely white tower with red roofs and grey cornices that make it very photogenic. 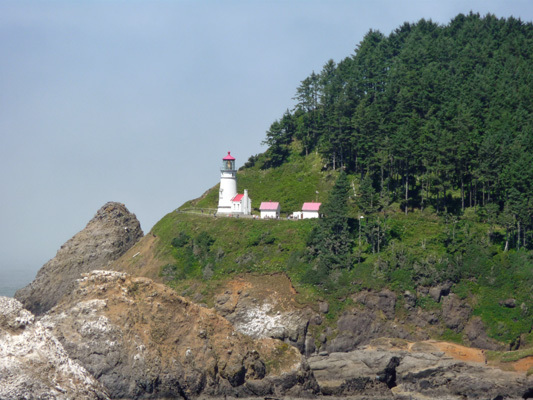 It is said to be the most photographed lighthouse in the US. That’s partially because it’s so gorgeous and partially because there’s a great viewpoint right on Hwy 101 just to the south where on the clear day you can take a really nice shot. I took this photo back in July 2014. But it could easily have been taken anytime the first few days that we were here since it was equally sunny and clear. The two little houses to the right of the main tower are oil storage houses. This was a kerosene light from 1894 when it opened until they finally put in their own power generating plant on the premises in 1934. People hike up the trail just for the view southward even when the lighthouse isn’t open. The little beach to the left is where the parking lot is. There are sea lions who hang out in the area to the far right. And there are usually big colonies of Common Murres and Cormorants down on the rocks on the lower right. But this year, the birds haven’t arrived. They don’t know if it is because last year they were all harassed a lot by Bald Eagles who nest up on the headland in the middle of the photo (we watched an immature eagle soar out from that headland and chase all the birds off the rocks) or whether it is because the California Sea Lions ate all the food this winter when they came and gorged themselves down in the cove (they came further north than usual this year). The California Sea Lions have left now so we can hope that the birds will return. At the end of our first day, we helped close up the lighthouse and little museum and then hiked back down to the car. Boy, were we tired. When we got back to the trailer, we’d been gone nearly 8 hours. And we’d been on our feet nearly 5 of those hours. Frankly I hurt from head to toe. There are nice benches to sit on up by the lighthouse but in the process of taking and giving tours and talking with folks neither of us had sat down much. It’s a learning process! The next day, we were on duty again starting at 10:30. It was a training day for most of the newbies so there were 9 potential tour guides available. Walter gave his first 2 tours and I gave 4 more. We got to meet most of the rest of the volunteers (we still have a couple more to meet this coming week) and we had another gorgeous day. However, don’t let all that lovely sunshine fool you. It’s windy on the beach, up the trail and on the headland—I nearly lost my hat twice the first day. We dress in layers (t-shirt, fleece, raincoat, volunteer vest). When 3 pm came we were all ready to close things up, sweep the floors and head on back down the hill. On Sunday, we were on duty yet again from 10:30 to 3. Walter really got into the swing of things and gave 5 tours. I learned to relax and sit on the bench some but still managed to give 4 tours (there were eight of us on duty and it was so quiet they sent a bunch of the folks home). We had a lot of fun and by the end of the day neither one of us was as tired as we had been the first two days. We’ve learned a ton of really cool stuff about this lighthouse and lighthouses in general. And as our information base grows our confidence grows too. This is going to be a really fun gig. To make things even better on Sunday it was warmer and less windy so we all took our coats off (but still needed fleece and the vest) and sat and enjoyed the sun some. On Sunday afternoon we had a group of 3 adult grey whales and at least 2 calves swim by very close to shore. It turns out the mother’s keep their calves close to shore and use their own bodies to block the view of their babies out to sea in hopes of protecting them from attack by Orcas. See all the cool stuff you learn when hanging out with the Fish and Wildlife folks who man the scopes in front of the lighthouse? Having worked our first 3 days, we then got 3 days off. The normal deal is to work four, 4 to 5 hour shifts (including the commute from the campground and the hike up the hill and back) and then you get 3 days off. We’ll have Monday, Tuesday and Wednesday off all the time we’re here. We took the morning slow on Monday May 4th, doing a few chores around the trailer and then loaded up the computers to go over to the Day Use Area across Highway 101 from the campground to pick up our email. Huh? You say. Why go there? Because there’s a picnic table over there where there’s a good cell phone signal. We call it the “phone booth”. There’s no cell signal at all in the campground and we managed to get a decent signal down in the parking lot by the lighthouse but that’s several miles away. The Day Use Area is just across the street. We parked next to the picnic table, set up our booster and hot spot and sat in the truck with our laptops and read our email and did a little internet surfing. And listened to the waves and enjoyed the view. It had been cloudy in the morning but by about 1:30 we were having sun breaks and that made using the computers that much more challenging. Those screens really weren’t meant to be used in full sun. So we packed it all up and went for a walk on the beach instead. And wonders of wonders the sun came all the way out. 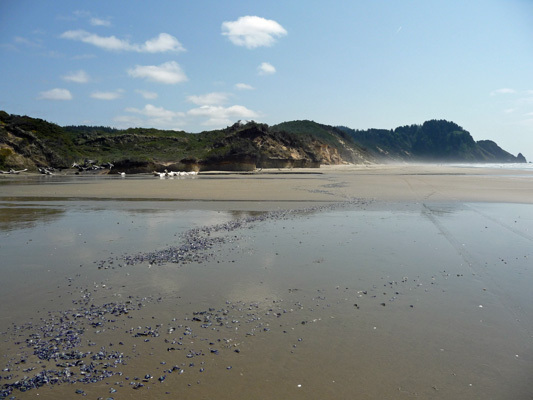 To get to the beach you follow a trail through a thick stand of shrubby shore pines and other low-lying plants. It dumps you off on the beach. 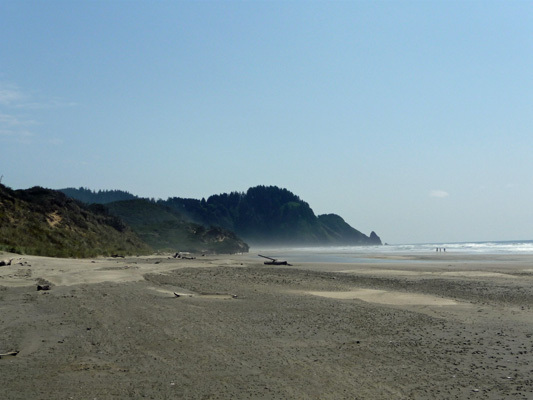 Looking south you can see the Heceta Head. And looking north you can see up the coast. There were a few other folks on the beach but it was Monday so it was very spacious at a beach that is known for never having anyone on it anyway. We walked south until we hit a little creek flooding across the sand so we turned around rather than getting our feet wet. But I stopped to take another shot of headland. 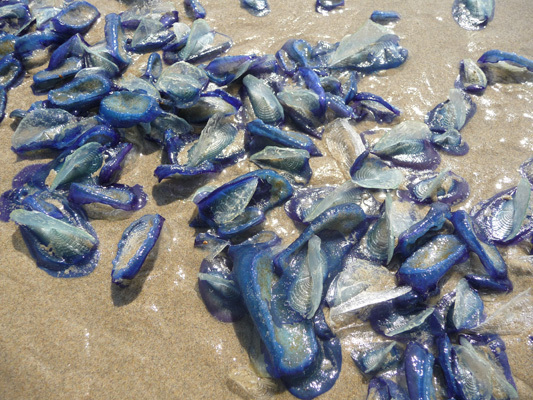 There were masses of these strange blue creatures all over the beach at the tide lines. They were brilliant blue and had a transparent clear fin on the top. 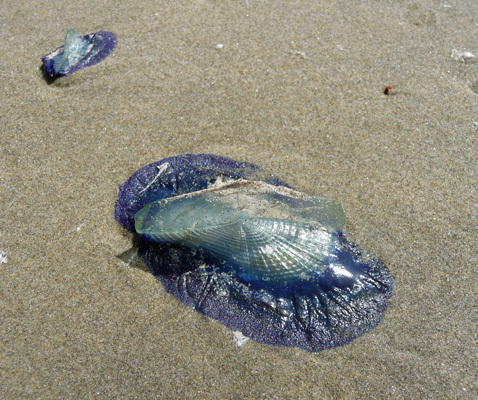 Note: These turned out to be By-the-wind Sailors (Velella velella). They were floating in the water too. And as the tide receded they ended up beached in mass. I picked one up and they were soft and rubbery and I could easily put my fingernail into both the blue and the clear parts. Here and there you could even find the clear parts sitting in the sand having come off the blue. I’d never seen anything like it. It turns out that they are a fairly common phenomenon and were washing up on beaches throughout Oregon and Washington at the time. They'd showed up on California beaches in the summer of 2014. They don't know why they beach themselves. 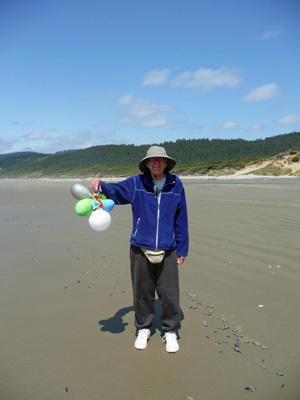 Meanwhile, Walter found a bit of trash to pick up on the beach—a bunch of mostly deflated balloons that had escaped from someone’s party—complete with nifty weight and a clip to hold it to whatever it escaped from. He also picked up a piece of tattered fabric. But otherwise the beach was very clean. Do you like his new hat? They had them at Costco when we were there a week ago. So now he has more than one great hat. This one doesn’t fold up in back so it’s not good for driving but it provides good all around shade and is a great color. We hiked northward a ways enjoying the completely sunny afternoon now that the fog bank had receded a ways out to sea—and there was no wind! The tide was pretty low because there’d been a full moon the night before. And you could tell from the tide lines up the beach that it had been really high in the night. On our way back to the car we passed a family with two young men playing a guitar and a mandolin. Walter whipped out his harmonica and asked to join them. And they had a wonderful time playing together. That got him all fired up and we spent quite a while when we got back singing and looking up songs in our song book. FUN! 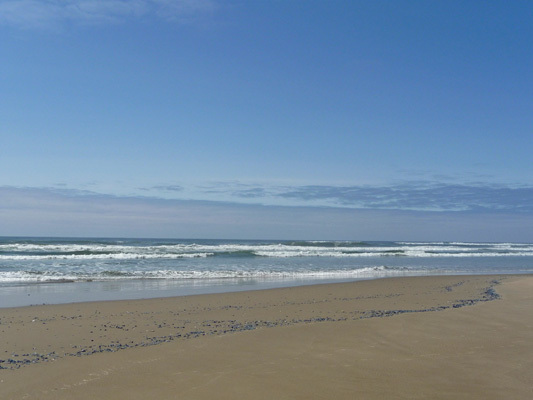 We’ve been blessed with gorgeous weather these first few days on the coast. No doubt one of these days it will be cold and rainy and we’ll be glad of our rain gear. But for now, we’re really enjoying ourselves.